TLC wants you to kick off the summer season the right way by offering you a chance to win a trip to Key West and a year’s supply of Snappers, a perfect blend of creamy caramel, rich chocolate, and the salty crunch of pretzels! TLC and Snappers will send one lucky winner and his/her family to Key West, Florida where they’ll have the opportunity to enjoy a three (3) nights stay at the Marriott Key West Beachside Resort, a seven-acre waterfront property and premier vacation destination in Key West! Plus, your family will receive a year’s supply of Snappers snacks! 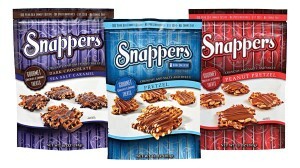 Ten (10) weekly prize winners, one (1) per week, will receive a month’s supply of Snappers. Enter today and every week, all summer long! Once per week, visit TLC.com/Snappers and fill out the sweepstakes entry form as directed to earn one (1) Sweepstakes Entry. Be sure to enter every week through August 31, 2015 for a new chance to win a weekly prize and a new chance to win the grand prize trip. The TLC Summer Sweepstakes is open only to legal residents of the 50 United States and the District of Columbia who are 18 years of age or older at time of entry.